The Rock Recycler was an interactive display built for the Arizona Science Center’s Forces of Nature exhibit. Utilizing a computer based interactive installation, they wanted to show how the 5 major rock groups can turn into each other via various external factors. And they wanted it to be entertaining for children. 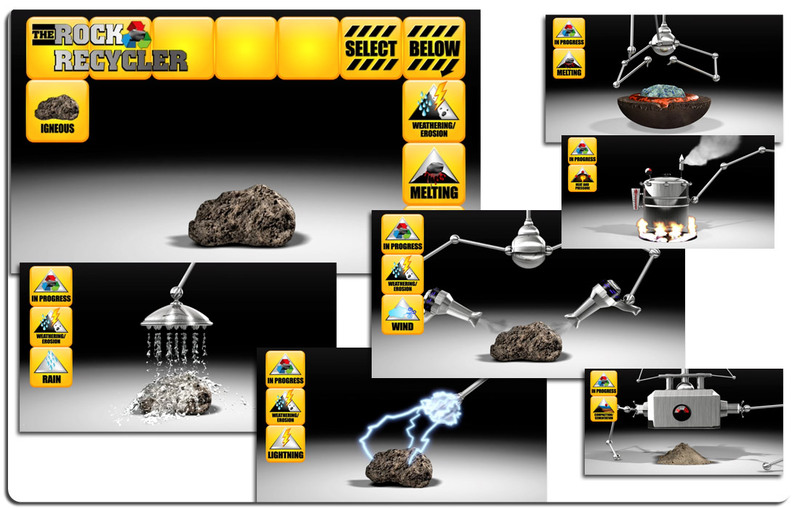 We created a series of robots that manipulated the rocks into their next forms. Modul8tion provided the art, programming, and sound design for the installation. It became the hit of the exhibit and and one of the few installations in the museum that withstood the abuse of children playing with it and always worked. First, the scenes for the animation were done as storyboards. Once creative was approved, we moved onto modeling. As renders were also approved, we had to make sure the beginning and end of ever scene “bumped” up correctly to the next one. All told, there were nine different animation sequences which needed to be produced, then inserted into the interactive shell.